I wanted this quilt to be all about the effect that light has on surfaces and colours and so I used green Oakshott cottons that I had left over from another project. These cottons catch and reflect light differently depending on the way they are cut, so I thought I could use this quality and five shades of green in a block representing the facets of an emerald held in a clasp setting. It is all made from the same size HSTs. I bordered it with linen to add contrast and to suggest the rough rock it comes from. This rather dim picture taken pre-quilting shows a bit better the effect of the direction of cutting on the reflection of light and you can also see that I used very slightly different shades of the palest green. It is machine quilted in the middle, using matched threads, to emphasis the sharp lines of the central block, and hand quilted over the rest in two strands of sand cotton, again for contrast. When it came to binding, my sewing machine stopped working! I made the binding by hand and laboriously hand stitched it on (and unpicked the dodgy bits and restitched it on...). My hand stitching was a lot improved after about five hours of this:-) The binding includes scraps of each of the five greens. Other details: the quilt is approx 26 inches square, so I am entering it in the Mini category. I am very, very happy with it - although I learned a lot about how I wouldn't do it next time! It is a difficult quilt to photograph, just because just like an emerald the colour of the Oakshott really shows when it catches the light. Here's my grandmother's engagement ring to show that the emerald is a good match! 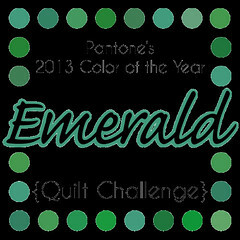 It matches the Quilt Challenge button too! The challenge linky is open until 17th March and there are some really amazing quilts, tops and minis there. You can visit the linky here or just click on the button to go to the flickr pool. I love that you managed to get a photo with the ring! It's a stunning quilt, I agree with Janine that you need some recognition! Oh wow it have turned out beautifully. Especially love the extra bits of greeen on the binding! It's beautiful!! Oakshott is the perfect choice - good thinking! And the graffiti. The binding looks great too, nice little stripy bits. I also have my grandmother's emerald and diamond engagement ring. Must have been the thing. Mine looks a different kind of green, more bottley. so so beautiful! I am extremely impressed by the hand sewn binding! That's dedication!! Your quilt has turned out wonderfully well done for sticking with it despite the cat interference and machine trials! Good luck in the competition too. Wow, the finished piece looks great, well done! It's a fabulous finish and perfect for the challenge. I adore your grandmother's ring too. The green really does match your Grandmothers ring, and I love the way you put the green scraps in the binding too, what a great idea. This is such a lovely quilt. I love the desing and the colors. You did an amazing job with this quilt despite all the obstacles. I love this! It really does match you grandmother's ring! What a lovely tribute! It looks absolutely beautiful!! I love your design and the Oakshott is perfect! What a labour of love to hand stitch the binding, your poor fingers must have suffered!! It's gorgeous! I love how you've picked up the central colours in the binding, but not overstated them–very stylish indeed!